Sri Lanka Jyotisha - Sinhalese New year Auspicious Times. 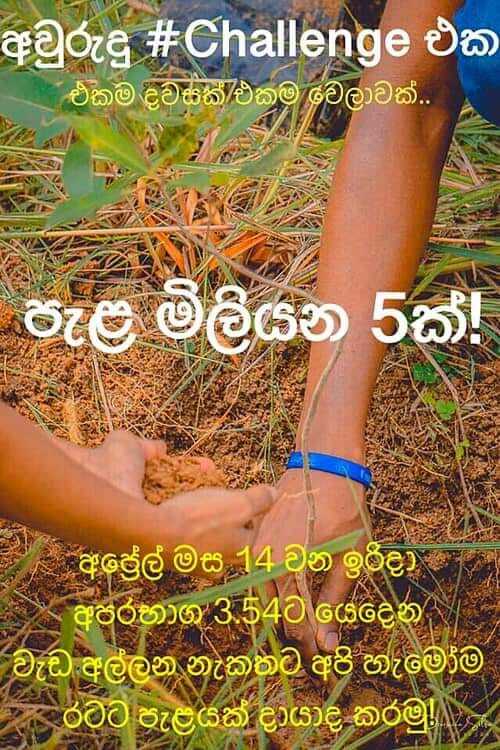 Sinhala Aluth Avurudu Nakath Seetuwa 2019 සිංහල අවුරුදු නැකත් ලිත. Curtsy "Lanka Panchanga Grahasputa Litha"
Due to health reasons and lack of free time and also the lack of desire to participate in the Nakath Times publishing competition or the apparent dog fight happening among the people who have no clues about what they are doing. And subsequently answer to the questions from people every time they phone and to explain again and again why that paper says this and I am saying this, what is correct and what is not. It is a hassle for me which I do not want in my life, as I keep my life very simple. What is the Dawn of New year ? It is the transit of Sun, (a celestial body) from Pisces constellation to Aries constellation..
Now I will ask a Question from you, It is this: Suppose you go and stand in a few different spots in the globe, say New York or Melbourne or Moscow or even at Timbuktu on the southern edge of the Sahara Desert. By doing that, can you influence or change the movement of Sun from Pisces to Aries ? No, you are insignificant, a speck of cosmic dust, when compared to sun. Without you, sun had for billions of years moved, and will move for billions of more years to come. It means that, there is no correlation between your position in the globe, and the transit of sun among constellations or the groups of stars. The Portion :(12:07pm+ 6:24 ) is called "Punyakalaye aparakotasa" - And during this period you do the Charithras or customs like "Ahara Piseema, Ganudenu Kireema and Weda Eleema. For these charithras or the customs you need Auspicious times to be calculated according to your location . As these auspicious times vary depending on your locality. What can we do for Auspicious times like Wada Alleema / Ganudenu Kireema ect? 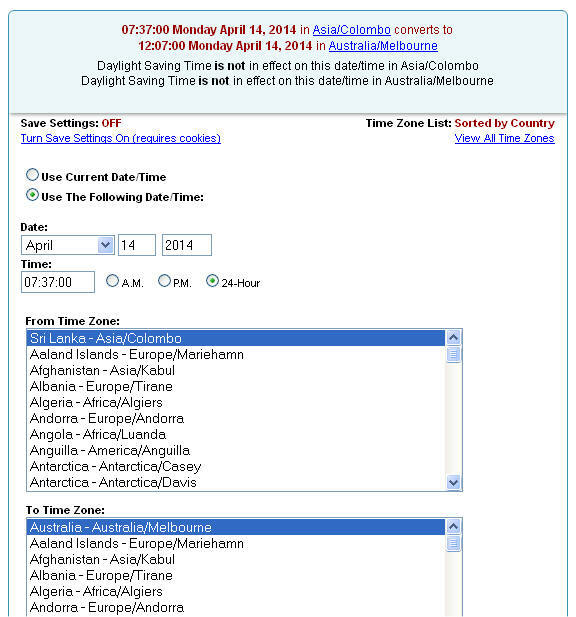 Earlier I used to calculate all auspicious times individually for different countries and cities. It is time consuming and Now I can not, my free times and hence my health is important to me . New year 2014 is dawning at 7:37 am on 14th April 2014 at Colombo time . What time it is in Melbourne ? Thus you can calculate that too.. When is Rahu Kala ? Frequently asked Question (FAQ): I was checking the auspicious times for Sinhala new year in your website and a news paper published in Melbourne.They show completely different times. I just wonder what is correct and what is wrong? This web site it self, is more than 12 years old now. And I live in Melbourne for the past 22 years. At that time (even 12years ago) there were no Sinhala news papers in Melbourne. Not even the oldest one which is "Pahana" News paper. (started by Mr. Varuna Savinda and Mr. Jagath Edirisinghe. Now managed by some one else.) This year (2013) I saw such newspaper had published two different Nakath Times by two people in the same page. These papers publish it because they have commercial interests. If they do not publish what ever the advertisers send then they loose their income. This web site is not an income generating one. I do not sell any thing here. NO Lakshmi Dhupas, NO Yantras, NO Mantras, NO Japamalas, NO Fenshui items, NO Lucky Charms, NO Get rich Quick secrets, NO Washee Karmas or Gurukams are sold. You will not see any payment buttons or PAID advertisements in this site. This site still looks as I designed it 12 years ago and unlike now, those days, very few people knew even how to make a website. Every thing in this web site is done by me. There are some pages in this website which interacts with you, like, greeting, answering your questions, doing calculations ect. Even with today's technology, making an Informative and also interactive website like this is not a easy task for a single person, since he needs to know astrology as well as programming and web designing. I did it as a service using my knowledge in astrology and the computer programming. I never had a commercial interest or a desire to establish myself as the Famous Astrologer in Melbourne. If I wanted to, I could have become a world famous astrologer, not only an astrologer in Melbourne. I made this web site because there were no Sri Lankan or Indian astrology websites at that time. I am happy as I am now. I do a day job and thank god, earn enough money to live comfortably. All I want is to live happily for another few more years and die. Life is short. Time is precious. Happiness is important, Running after superficial things is waste of time. At that time, I mean about 10 -15 years ago, when people I know, wanted to learn the New Year Auspicious times for Melbourne and other cities they phoned me. Since I was inundated with calls, as a solution to that, I calculated and posted Auspicious times in my web site for the benefit of people who trust my advices and abilities. So these are the times I give for people I know. They know who I am and I have nothing to prove or explain. When talking about New year auspicious times, there is no consensus among astrologers about it. Some years ago different News papers, and "Panchanga Lithas" in Sri Lanka were publishing different New year Auspicious times for Sri Lanka itself. And people were confused. Because of that ,Sri Lankan government had to intervene and had to establish "Aurudu Nakath Committee". So every body published one set of Auspicious times for Sri Lanka. Unfortunately for Melbourne or any other city in the world "The Nakath committee" do not calculate or publish auspicious times". The auspicious times given by me are calculated by myself using the sun rise and set times and the time zone given in the table here that is my basis of calculations and done according my best of ability and knowledge. Hence I believe these are the best auspicious times. You are free to use it if you trust me . If not, you can use the times published in different news papers by different other people. I can not answer for the works of other people and tell you how did they calculate their auspicious times on what basis. So if you are asking me why they had published different times ? ... I do not know...I can not answer for their work.. Nor I do not want to criticize or analyze other peoples work. I am beyond that stage of life.. They may have done it according to their best of knowledge too.. I mind my work and I can only answer for my work which is the given auspicious times and they are correct according to my belief. You are free to either accept it or reject it. I did it as a service.